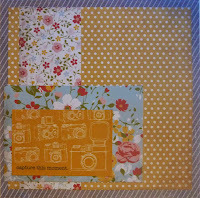 I love the new Start to Finish Challenge over at the SJ Crafts blog - the idea is to Start with Sarah's basic layout, then Finish by adding photos and embellishments in whichever way takes your fancy. I love this striking photo of my son, taken by his Dad during one of their camping trips. Richard was a curious, thoughtful little boy - he often had an unusual way of looking at things and making sense of the world and I think this picture shows that aspect of his character. Underneath the photo you can see a little zipper - this was punched from silver card with my new EK Success border punch, then I finished it off by adding a scrap of paper that has a stitched detail. The chipboard frames are from The Pier - love these things! Light blue acrylic paint was used to colour various chipboard and wood veneer pieces to suit the page. I love the contrasting textures of wood, cork, chipboard and bark. Lots of splattering with ink as well - maybe a little too much, but I was having fun! Thanks for dropping in today, see you again soon. What a fun and different challenge. Now that I am not on any DT's I will have time to play more and will definitely check this one out. I love the finished layout and your spin on it. Such a sweet photo and I love love the stars. I have that range of papers too... love this layout Annie. Such a cute and busy layout.